HARLEM — Security guards were stationed on foot bridges Monday outside the East Harlem Target where police say two 12-year-old boys hurled a shopping cart, sending it plunging four stories and critically injuring a woman. Upper West Side real estate broker Marion Hedges had been at East River Plaza with her son when she was struck by the cart. Yolanda Lopez had witnessed the horror on Sunday. On Monday, she was back at the plaza trick or treating with her son. "I saw the woman laying on the ground. It was awful," said Lopez. The sight of extra security left her reassured. "They should do that everyday," said Lopez, who works as a security guard. "They should have security on every floor, that way no one would throw anything." Shoppers at the East Harlem mall said they were outraged and fearful after they heard about Sunday evening's incident. Some called for more security while others said the boys should have had more adult supervision. The two 12-year-olds, who live in nearby public housing, were charged as juveniles with felony assault and criminal possession of a weapon. According to police, a third boy urged the two boys not to push the cart over the edge. Hedges, who sits on the boards of some of the most elite charities and boards in the city, was not breathing after the incident but was revived after receiving CPR by a resident at Columbia Presbyterian Hospital. 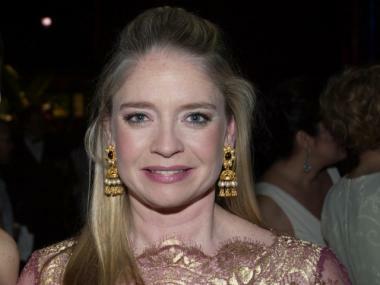 The 47-year-old broker for Prudential Douglas Elliman was listed in critical condition at Harlem Hospital last night. "This makes me worried because it could have been my wife or any one of us," said Christian Vargos, 21, Monday. Security guards stood on the pedestrian bridges of the mall Monday night. Some from Target helped shoppers with their bags. Susan Mahoney, whose husband Gaurav Patel was the Columbia Presbyterian Hospital resident who helped revive Hedges, said a Costco employee at the scene was upset because an earlier call made to Target about the boys throwing Slurpees onto customers was ignored. "Target security told her they did not handle anything outside of their door," said Mahoney. Target did not respond to a request for comment. Gary Lewi, a spokesperson for East River Plaza and Blumenfeld Development, which owns the development, said he was unaware of prior complaints. "This is the first time I'm hearing that there were prior complaints, that these individuals are accused of throwing other things," said Lewi. "This is a multi-million (dollar) facility that spends a lot of money on security." Patrons at the mall said they were both shocked and worried about the incident. "It's ridiculous you can't even shop in the mall anymore," said shopper Nelson Rosa. "I come here all the time with my kids and I've never seen anyone throwing anything from the floors, but I'm going to be more careful," said shopper Millie Ayala. Lopez, who was with her 13-year-old son Monday, echoed the same sentiment, saying she tried to walk away from where the pedestrian walkways were located when she entered the mall Monday. She also wondered whether the boys charged had enough adult supervision. "I supervise him to make sure he's not doing anything bad," Lopez said while looking at her son Luis Ortiz. "Kids should not be throwing stuff," Ortiz chimed in. "If it happened to her it could of happened to me."